Most baked dips, while usually delicious, aren’t exactly healthy. I love a nice creamy baked artichoke dip or a warm pinto bean dip covered with melted cheese, but they aren’t something I feel like I can indulge in all the time. That’s why I’m so happy I discovered this Baked White Bean Dip with Rosemary and Parmesan from Faith Durand’s new cookbook, Not Your Mother’s Casseroles. It satisfies my craving for a decadent warm dip, but is healthy enough to enjoy whenever I want. 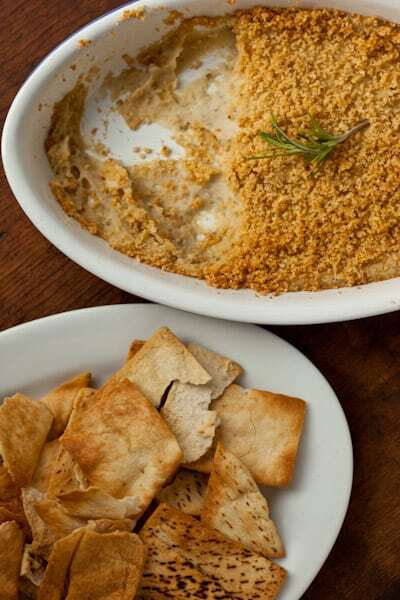 The dip is a snap to make and uses pantry staples like canned beans, olive oil, and bread crumbs so it’s easy to throw together for unexpected guests or impromptu gatherings. I’m pretty picky when it comes to accepting review copies of cookbooks because I just don’t have room for more books. But I love casseroles, and I really liked the idea of a casserole book with 200 recipes, not one of which calls for a can of condensed soup. Not Your Mother’s Casseroles was written by Faith Durand, managing editor of Apartment Therapy’s The Kitchn, so it should come as no surprise that the book is fantastic. There are a few classic recipes like Basic Potluck Baked Beans with Bacon and then there are fun new twists on classics, such as Mediterranean Tuna Casserole with Olives and Capers and Twice-Baked Potatoes Stuffed with Ricotta and Ground Sausage. I especially love the “Baked for Breakfast” section that includes recipes for Basic Baked Polenta with Maple Syrup and Lemon Brioche French Toast. Next on my list to try is Bacon and Lentils with Egg, which is located in the breakfast section but could easily be turned into lunch or dinner. Although some might be disappointed by the complete lack of photos, Faith’s creative recipes had me hooked as soon as I started thumbing through the book. If, like me, you believe that casseroles can and should involve more than a can of this and a packet of that, Not Your Mother’s Casseroles just might be the book for you. I’m happy to say that it will take up permanent residence on my already crowded cookbook shelf and I can’t wait to try more of the recipes. 1. Preheat the oven to 350 degrees F. Lightly grease a 1-quart gratin dish with olive oil. 2. Put the beans into a food processor along with the garlic, rosemary leaves, and shallot. Blend in pulses until well pureed. 3. Add the yogurt, 1 tablespoon of the olive oil, and the salt and pepper, and blend until creamy. Pour into the prepared baking dish. 4. Combine the bread crumbs, Parmesan, and remaining 2 tablespoons of olive oil. Sprinkle evenly over the pureed white beans. (At this point the casserole can be covered and refrigerated for up to 24 hours.) Bake, uncovered, for 18-20 minutes, or until the topping is golden brown and the dip is hot. Serve immediately with pita chips, small rye toasts, or cucumber slices. *The original recipe calls for two shallots, but I have found that one small small shallot works best. So... would it still be considered healthy if I ate the entire pan of dip in one setting? Because that looks so tasty that I think I could! mmmmmmm! Looks amazing!! I'm gonna have to give this a try for sure! I should never read cookbook reviews because unlike you I have no self control (and like you I am rapidly put of room) and I can see this is fast tracking it to my want life. I'd already been wondering about it- I love one pot meals so of course I love casseroles. How internationally influenced is it?Anyway this looks fantastic. Bookmarked (until I get the book of course lol). I hate auto correct. Want LIST. OUT of room. Sigh. Good recipe! I use the liquid inside the can for soups, combined with broth. Yum! That looks comforting.I think that white beans are under-celebrated. looks yummy..what is the calorie count, serving size and sodium intake?? Ooooh that does look really good and healthy Nicole! I've been eyeing that cookbook, I need to take the plunge and get it! This looks amazing! 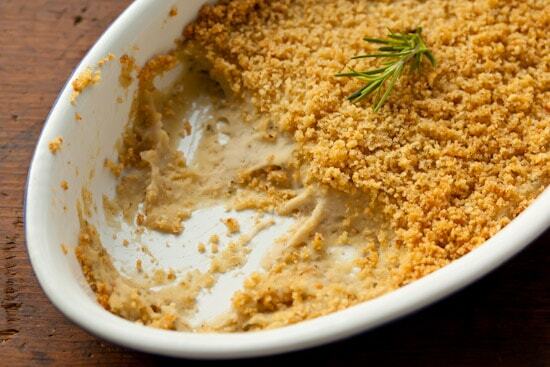 Beans, rosemary, crunchy bread crumbs on top.....what's not to love. This looks so creamy and delicious, I wish I were eating some right now. Always looking for ways to add beans to my diet, thanks for the reminder that there are more to beans than hummus. It sounds really great. Since I've been on a diet, I've been desperate for ways to eat healthy that go beyond the traditional salad route. Thanks! I'm going to love that crunchy topping! Will make it when my daughter comes home! Yesterday, I made white bean puree, it was so good that I'm falling in love using white beans. Love the crunchy top. I bookmark the recipe. This looks really good, love that its healthy! Thanks for sharing!! I love the choices you make! Thanks for sharing, very excited about making this! White bean dip is one of my favorites. I really like this version with parmesan and rosemary. Great choice! I served this at a family birthday gathering over the weekend and it was a big hit. Hmm, I tried this (dried beans, potato masher and a sharp knife) and my verdict was it needed a little something. I threw a thin layer of cheddar on top for reheating and all was golden. (My fiance thought it was fine as is. )As an aside, although it's probably the directions from the recipe book, I was a bit offended to see the directions specifically calling for a food processor. It could have been phrased something along the lines of "combine into a paste -- a food processor will give you a more even consistency". "Time Savers" should never be the requirement. I only have dried beans that I can soak and cook until tender. How would that translate from the 15oz canned? Would I still use 15oz of the soaked/cooked beans without any liquid? Do they even count the liquid as part of the ounces weight in the can? It's been so long since I've used canned beans I can't remember. my kids love raw veggies with dip. If I made this, they would be getting even more veggies and not even realize it! I'm going to give it a try! Been looking forward to making this ever since you posted it.... Finally made it this afternoon! I followed the recipe precisely, and tasted it before baking it as I always do. All I could taste was onion! I had used two shallots as specified. So I doubled the recipe (I had more of the ingredients) but didn't add any more onion, and still, even after baking, the entire thing just tasted like raw onion. The whole house smells like onion actually. I'm wondering what you think could have gone wrong, or why that would be the case? Thanks for your help. I made this last night to stick in the fridge & eat later tonight. @CAA, like you, I tasted a bit before putting it in the fridge, and yes - MAJOR onion flavor. I too used 2 shallots. I squeezed half a lemon in to try and cut the onion taste (like with hummus). We'll see how it comes out tonight... Next time maybe I'll just do one shallot? I'll look forward to other readers' results. I've been making a lot of fresh bean dips lately, the idea of a baked one caught my eye. Would this still work without the bread crumbs? Maybe mix another cheese with the parmesan? this looked so awesome, i gave it a try today. it's better than the hummus i'm used to making!! Made this for Thanksgiving with homemade garlic pita chips, and it came out great. I tweeked it just a bit by adding a dash of cayenne and a squeeze of lemon juice. Made this for Thanksgiving with homemade pita chips and it came out great. I tweeked it a bit by adding a dash of cayenne and a squeeze of lemon juice. The vegetarians with the kids with dairy- and now a wheat-allergy came to town. Let me tell you I was happy to find this recipe! I cook my own heirloom beans with a lot of aromatics so flavor is never an issue. Used gluten-free bread crumbs and plain goat yogurt although sheep yogurt would have been even richer. A little parmesan can be tolerated, fortunately.Everything is looking great so far and it's in the fridge for tomorrow (two shallots felt instintively wrong before I read the comments so I had already reduced the amount).